The set consisting of a MARK IV Hyperion 8-24 mm Universal wide angle Zoom eyepiece (#2454826) and a Hyperion zoom Barlow 2.25x (#2454654) results in a combination of a zoom eyepiece with a large focal length range. The set covers all eyepiece focal lengths from 3.6mm to 24 mm. This set can only be used on astronomical telescopes; use with spotting is only possible without the Barlow lens due to the limited back focus of those optical systems. 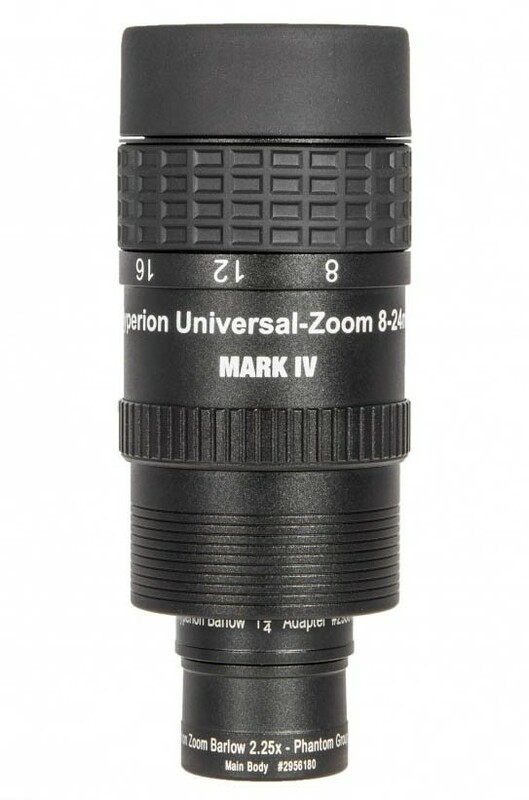 1) 1x Hyperion Universal Zoom MARK IV, 8-24 mm eyepiece with ClickStop Action (#2454826) that is a versatile wide-angle zoom eyepiece with connection option for cameras. 2) 1x Hyperion Barlow Lens 2.25x (#2454654) that increases the focal length of your telescope by a factor of 2.25, with docking adapters for camera (T2-system) and zoom eyepiece. The Hyperion Barlow works with every Hyperion 8-24 mm Zoom eyepiece ever produced. The barlow is attached onto the 1.25"-nosepiece. Because of the dual nosepiece of the Mark IV, it can be used at telescopes with 1.25" or 2" eyepiece clamps. The Hyperion Barlow comes with a T-2 thread-adapter, to mount the Barlow in front of any camera or other accessories with T-2-threads. Combine it e.g. with a DSLR-camera – in this way the camera body will be equipped with a 1.25" nosepiece. The camera body just needs a standard T-ring to fit it onto any 1.25" eyepiece holder. 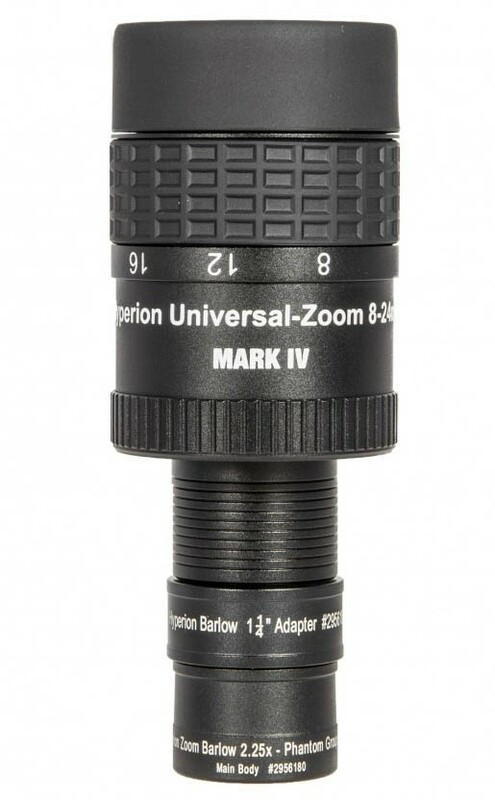 Attach the lens unit without the Barlow-adapter (A) directly onto many 1.25" eyepieces, whenever they do not already have an integrated barlow element. The result is a 2x Barlow with very good optical properties (see left image). 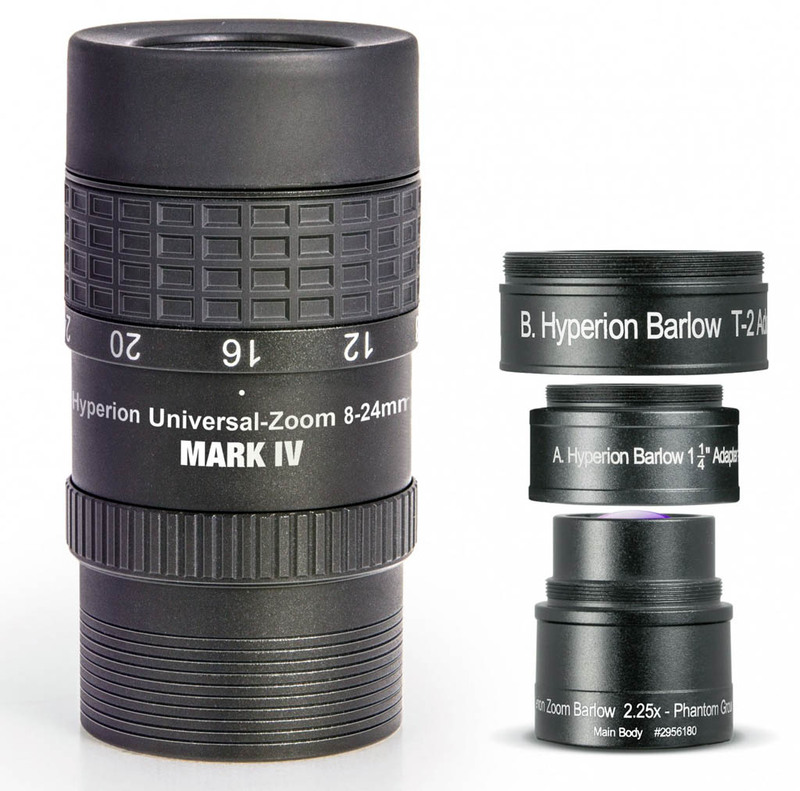 Attention: The Barlow lens is only suitable for use with astronomical telescopes; the use in spotting scopes is not possible.